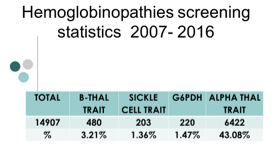 The diagnosis of haemoglobinopathies has become an increasing challenge in multinational European countries, Australia, USA, Canada and recently in emerging haemoglobinopathy ‘hot-spots’ such as the Gulf Countries. The United Arab Emirates (UAE) and Dubai, in particular, is one of those countries where haemoglobinopathies pose a national health concern. Accordingly, over 200 nationalities were potential candidates for a mandatory national screening programme launched in 2006. Haemoglobinopathies (a-thal, b-thal, Hb variants) occur at a relatively high frequency in the UAE. Detection of common haemoglobinopathies is simple; however, the complexity arises from extensive a- and b- globin gene interactions. The ensuing genotypes and phenotypes result in widespread heterogeneity thus rendering Dubai the most heterogenous nation worldwide hitherto with 55 b-globin gene defects. The above campaign was launched to raise awareness on genetic blood disorders such as Thalassemia, Sickle Cell anaemia and G6PDH (Glucose-6-phosphate dehydrogenase) and tackle public health concerns and related issues for creating a healthy community. Situation at the time of launch: Thalassemia was a major public health issue in the UAE. The official data available showed the prevalence of Thalassemia to be 12% among the target population. Methodology: The campaign team of 260 volunteer ambassadors from 13 UAE educational institutions including Higher Colleges of Technology, UAE University and Dubai Women’s College were guided by the UAE GDA research team. The post campaign surveys showed that the awareness of genetic screening increased among student communities relatively from 6 percent to 96 percent. A total of 11281 UAE national female college students were screened during 2007-2011. The a-thal / iron def. anemia, b-thal, bS and G6PDH carrier frequencies were 54%, 4.2%, 1.8% and 1.9%, respectively. The relatively lower incidence of bS was attributed to a regional effect where the samples were from the northern emirates. The screening test costs 120 dirhams ($33) in UAE GDA lab. Price of caring for a child with thalassemia, estimated at 1.2 million dirhams ($327,000) up to the age of 16. Conclusion: In the UAE, successful screening programmes have played a profound effect in reducing the birth of thalassemic babies and had an enormous impact on public awareness of haemoglobinopathies. The UAE Genetic Diseases Association was founded in 2004 as a nonprofit organisation and strives to reduce the prevalence and impact of common genetic disorders in the UAE through preventative awareness programmes, screening based on research studies and knowledge sharing, conducted by experts in the field using the most innovative technology at the lowest costs. UAE GDA conducts research in the fields of Autism, Alzheimer’s, Breast Cancer, Celiac Disease/Gluten Intolerance, Childhood Cancer, Duchenne Muscular Dystrophy, Diabetes type 2, Familial Hypercholestremia, G6PD, Neural tube defects, Sickle Cell Anaemia, Thalassemia and Vitamin D deficiency.